There is an anecdote that has been sitting in my heart for a while. It is a story about baggage and unknowns and grace. A tale of being content to leave things we don’t understand in our Father’s keeping. It is a story that I’m learning to live at the moment. “Father, what is sexsin?” He turned to look at me, as he always did when answering a question, but to my surprise he said nothing. At last he stood up, lifted his traveling case from the rack over our heads, and set it on the floor. “Will you carry it off the train, Corrie?” he said. “It's too heavy,” I said. It is these words I’ve been allowing to turn around my heart for the last few days. It is these thoughts about how God carries the heavy stuff for us until we’re ready to bear it that I’ve been massaging into my soul. We have a Father in heaven who carries the hard stuff for us, who shoulders the burdens that are too heavy for us to carry. It is a grace that is enough. A grace that comes into its own in our weakness. A grace that carries the heavy stuff when we’re struggling just to stand on our own two feet, a grace that reaches out to steady before we even know we’re faltering. I don’t know about you but I find too often we’re stubborn. We want to prove to God that we’re strong and can shoulder the heavy stuff. When really all we’re doing is telling God we don’t really need him. We take the thing that is too heavy for us, the thing that God is carrying for us, and it crushes us. And then we turn to God and ask him to rescue us, to lift us up in our time of trouble. And God does. 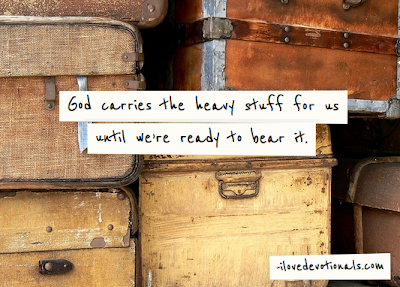 He comes to us, and he doesn’t take the baggage, but he helps us to carry it. That is God’s grace too. Where have you experienced God’s grace in your life this past week?